Your movies are great and we think that the whole world should see them. 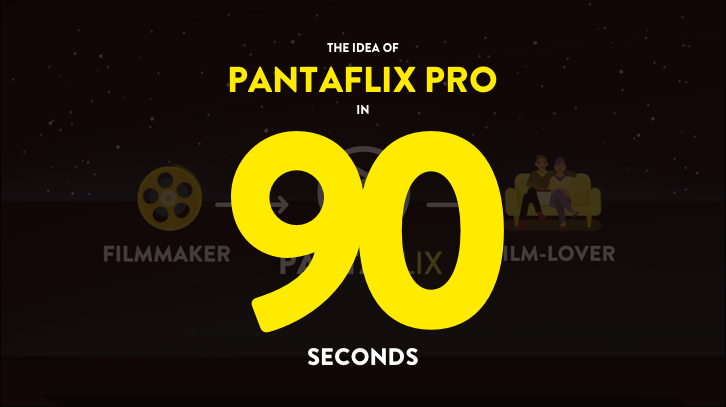 That’s why, on the one hand, we created PANTAFLIX PRO for license holders like you, so making your movies and TV shows available around the globe becomes as easy as possible, and PANTAFLIX, on the other hand, as a state of the art Video-on-Demand streaming platform for a worldwide audience of filmlovers. By offering this holistic solution we bring together what belongs together: Your movies and your audience. Select the countries you want your work to be available in, put in the metadata and choose your visuals - with just a few clicks you are all set up. Using our embed player you can then share your movie on your own page or wherever you want or you make it available to PANTAFLIX users on our platform. No matter what you choose, you can rest assured that you get paid for every rental, every time. Our embed player is the perfect foundation for selling your movie digitally. 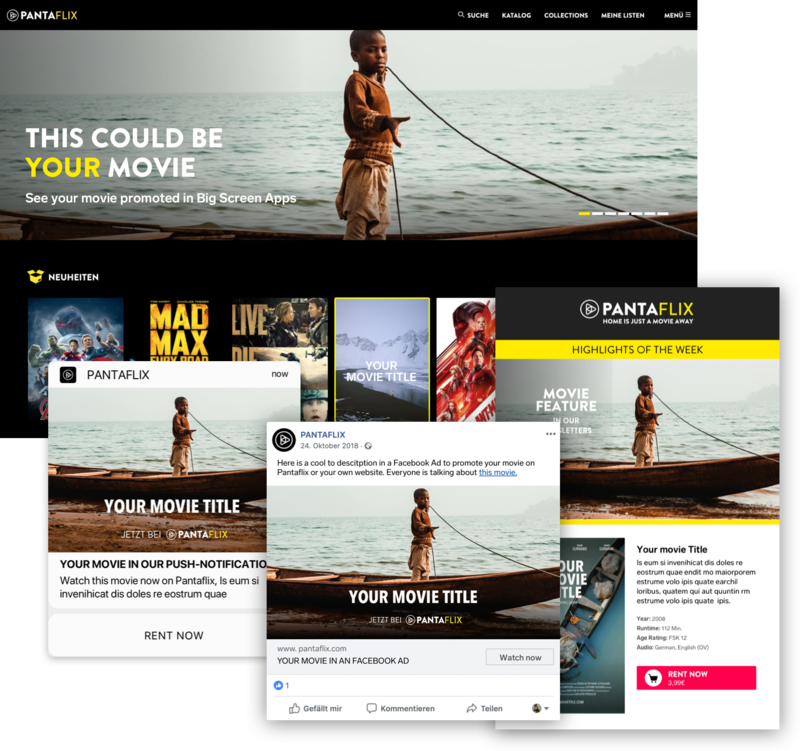 It’s the backbone of our VOD-platform PANTAFLIX and allows you to share your movie in the simplest way. By integrating your movie into your own website or the ones of your partners, you become your own distributor and make it even easier for your audience to find you. 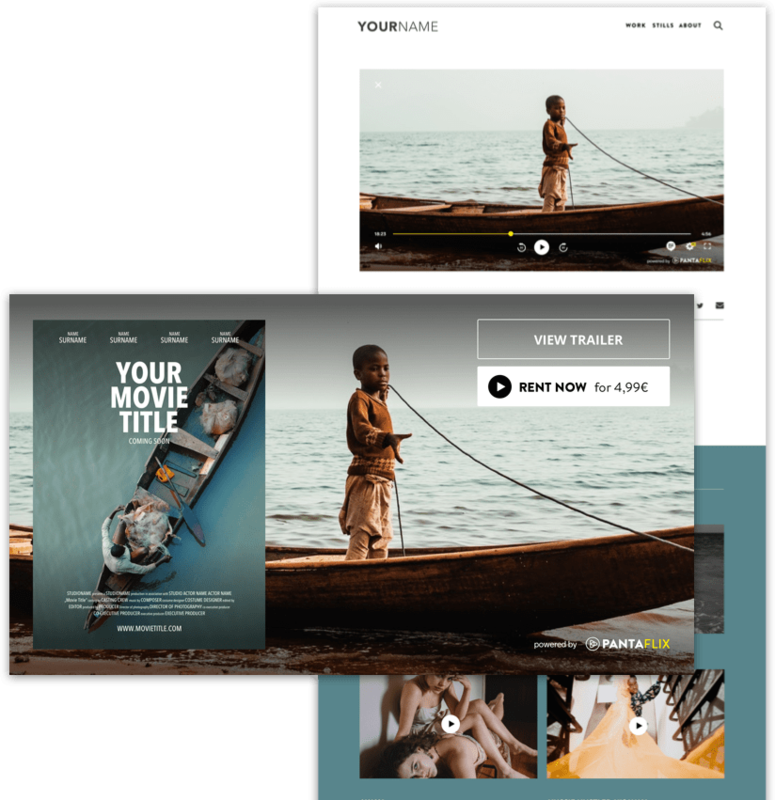 With its strong performance and high usability our embed player is the effortless way to making your movie streamable and increasing sales. Interested? We’re happy to advise you technically and strategically in finding a customized solution that caters to your needs. It’s clearer than ever: We live in an attention-based economy. With all kinds of distractions competing for your audience's attention it can be quite a challenge to draw them to your movie. Luckily for you we have years of experience under our belt in doing just that. By using our wide array of marketing tools in an efficient and purposeful manner, we can make sure that your target audience finds its way to your movie. If you have any questions about how we can support you in selling your movie, feel free to ask us. When selling your movies online, there’s nothing more important than keeping a clear overview of what’s happening. Our built-in management tool is easy to understand and allows you to keep track of your titles, their availability in different territories, as well as updating the according metadata and images. Once you have set up your account, we will guide you through all the steps that are required in order for your movies to go live and find their worldwide audience. 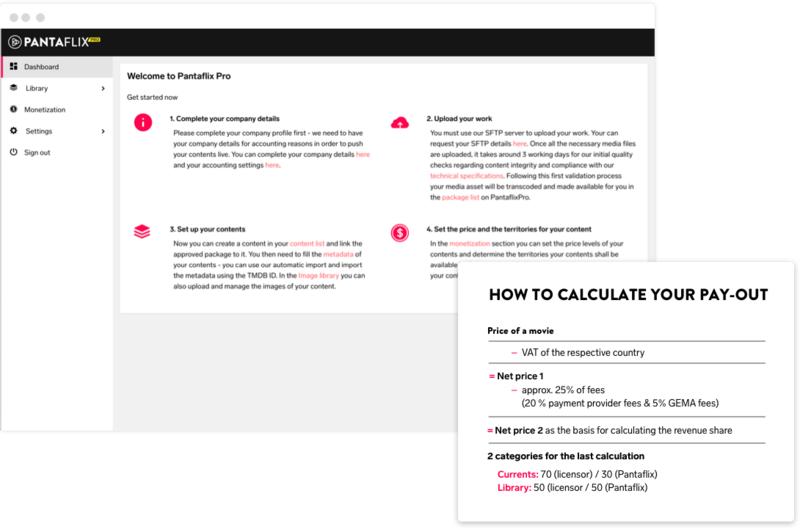 Create your Pantaflix PRO account now, upload your work & get it seen by people all around the globe. Still not convinced? We’re always ready to help and explain. In our FAQs you can also find more information and answers. We hope to hear from you soon! Don’t be shy! Our custom built Video on Demand platform is on track to become the best away-from- home platform. 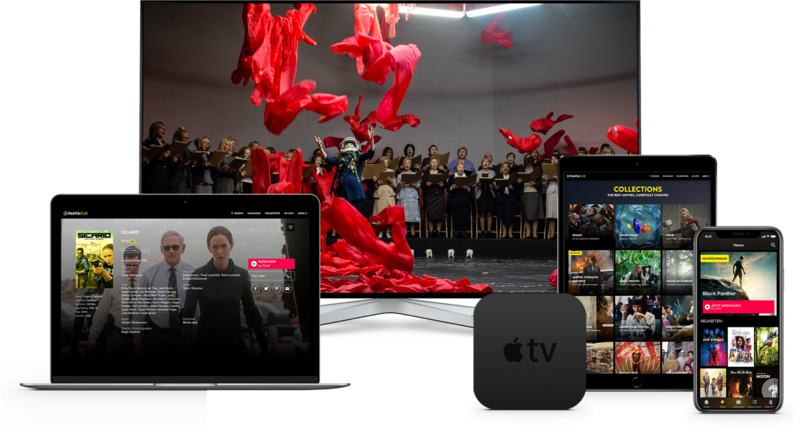 With PANTAFLIX now being live in 67 countries and seven languages, audiences all around the world can enjoy fantastic entertainment from a portfolio of national and international films and series. show more Our catalogue boasts thousands of titles from studio movies to short films and independent movies, so we can assure you that your work is in good company. Curated collections and an intuitive search make it easy for the user to navigate his way through the platform and find your titles. Let PANTAFLIX be the home to your movies, so they can make a global audience feel right at home. PANTAFLIX Technologies GmbH © 2019. All rights reserved.